Peachland sees up to 85cm of snowfall every year. In addition, due to 11km of lakefront, the city also experiences mild lake-effect snow. This is enhanced via orographic lift (where terrain forces air to rise and cool, creating clouds, precipitation and snow) thanks to the steep mountainside on which Peachland sits. There’s no denying this region is known for its vast array of winter activities. However, the last place you want to see an ice rink is outside your front door. 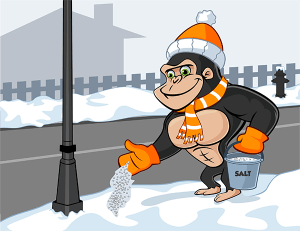 That’s why Gorilla Property Services are now offering Peachland Snow Removal and Salting for Strata and Co-Op clients exclusively. As a property manager, you have enough on your plate. Then winter rolls around and now, all of a sudden, you’re tasked with the late nights and early mornings that come hand in hand with salting and snow removal. On top of everything else, you have to make sure all your residents have safe access to their homes and vehicles. That alone can be a daunting task. We’re offering an alternative. Stay in bed and let our fully trained and certified Gorilla technicians take care of it for you. Our Peachland Snow Removal and Salting Programs start in December and run until March. We’ll watch the weather on your behalf. We’ll ensure that all the common, exposed areas of your property are completely salted the night prior to a predicted drop in temperature. Any snow removal is carried out in the early hours of the morning. Our goal is maximum result with minimal disturbance. This means we’ll never use anything louder than a mechanical snow blower in the building’s immediate vicinity. We do, however, offer complete parking lot salting with the aid of our trusty ‘Gorilla Mobile’.